In the second of a five-part series, Craig K. Chandler offers more tips for cutting your carbon footprint. This time: reducing emissions at home. Our homes are not only the single most valuable possession most of us ever own … they’re also one of our single largest sources of carbon dioxide emissions. But there ARE things we can do about that. – maintenance of the interior and of the surrounding landscape. 1) Live in a smaller home, in particular once we reach the “empty nest” stage. Even as average family size in the U.S. has decreased over the last few decades, median home size has increased. In 1973, the median size new home in the U.S. was 1,525 square feet, with the average household size at 3.0 persons. But by 2010, the median size new home had increased by more than 600 square feet, to 2,169 square feet, even as the average household size had dropped to 2.6 persons. 2) Purchase renewable energy from local or regional power suppliers. This option is available to at least 50 percent of U.S. consumers, according to the U.S. Department of Energy. Customers generally pay a small premium in exchange for electricity generated from renewable sources – which are either carbon-free (e.g., wind and solar) or carbon-neutral (e.g., biomass). 3) Let nature complete the cycle of death, decay, and renewal of your outdoor trees and plants. Many homeowners unwittingly break a natural cycle that has been ongoing since trees started inhabiting the Earth. This is the cycle of leaf drop, decay, and leaf re-emergence. After leaves reach a certain age and die and fall to the ground, they decay and the elements they contain (nitrogen, phosphorus, potassium, etc.) are absorbed by the root systems of the same trees that dropped the leaves. These elements are then used by the tree to create new leaves. Uninterrupted, this cycle repeats itself annually. This cycle explains why trees in a native setting do just fine without additional supplemental fertilizer. Essential elements are recycled. Also, the organic carbon-based compounds in the decaying leaves help to maintain the structure and water retention capacity of the soil. But for reasons of neatness, or as a result of incorrect beliefs that by removing fallen leaves, turfgrass can grow under the trees, these leaves are raked up and stuffed into what are usually petroleum-based plastic or recyclable paper bags needing, you guessed it, transport and disposal. The inability of turfgrass to grow thick and lush under shade trees has more to do with the shade than with the fallen leaves. Turfgrasses are full-Sun plants and need to be in a high-light environment to thrive. The key here is to not over-prune or cut down valuable shade trees. Instead, grow shade-tolerant shrubs and ground covers, but not grass, under the tree’s canopy. Some may argue that disposing of leaves is not such a bad practice because many municipalities take leaves and other yard “waste” to a composting facility. However, this practice is not as environmentally sound as simply keeping the leaves in place. Fossil-fuel burning trucks are needed to transport the leaves to the composting facility, and fossil-fuel burning heavy equipment then is used to process the leaves into finished compost. For those bothered by the “messiness” of brown leaves scattered over the lawn, periodically running a lawn mower over them can ease that discomfort. The mower will break up the leaves, and the leaf fragments will quickly disintegrate into the lawn. And the same holds true for grass clippings. 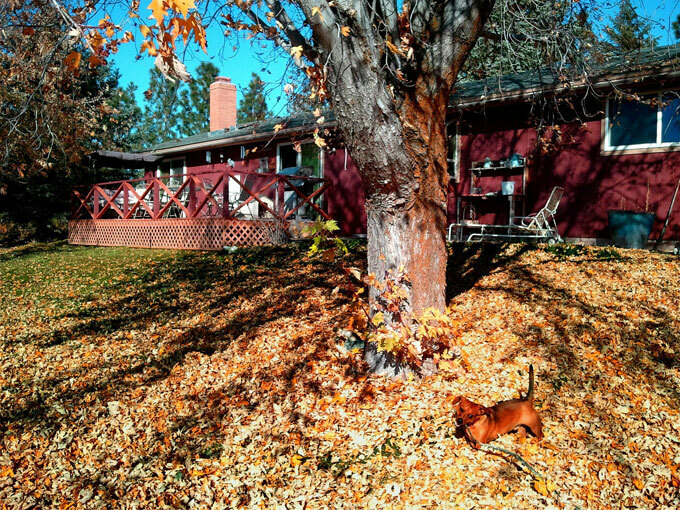 If there are areas of a lawn where leaves tend to accumulate … Voila! Those leaves can be collected and used to mulch around trees and shrubs. That leaf mulch breaks down quickly, compared to wood- and bark-based mulches, but it’s nutrient-rich, renewable, and … free.